Warhammer II: Preview by Shankbot de Bodemloze Creative Assembly have announced their latest Total War title, the stand-alone sequel to 2016's Total War: Warhammer - that's right, Total War: Warhammer II. The game was announced in March 2017 at EGX Rezzed in London and is due to be released later on in 2017. 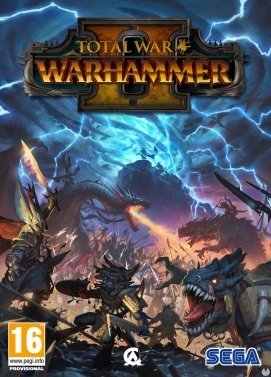 Set in the same Warhammer Fantasy universe as its predecessor, Warhammer II will feature a campaign map that spans across the continents of Lustria, Ulthuan, Naggaroth and the Southlands, with four playable factions, each with two legendary Lords, giving players a total of eight unique starting positions. A cinematic trailer was released following the announcement, which can be watched on the Total War YouTube channel, revealing one of the main features of the new campaign in Warhammer II - the Great Vortex. However, despite its polished looks, there is no gameplay footage to tease at how the game will be presented or what it will look like - this all means there is lot we are left wondering about. Thankfully, CA have been kind enough to divulge a bit of information on their latest game here and there - what this articles hopes to do is draw it all together and find out what we know so far about Warhammer II. Disclaimer: please note that as this game is still in development nothing, including what CA have said, is currently set in stone so certain features may be changed, added, or removed. With that in mind, below are a list of things we can expect to see when the game is released later this year according to the current moment in time, padded out with some of my own speculation for what it could all mean. Each race is unique and will feel very different to play. Each has unique and iconic battlefield units, characters, monsters, war machines and tactical strengths on the battlefield. In campaign, each has its own suite of unique campaign mechanics built around its backstory and lore in Warhammer Fantasy Battles. In short, each race offers a very distinct way to play. So if all goes well, expect to see a range of different ways to play the campaign and fight on the battlefield depending on which faction you choose. Alongside this there will be a range of different (assumed non-playable) sub-factions featured as part of the campaign, including from the previous game, mirroring Warhammer lore about who inhabits the regions of the New World. This will add flavour to the game so players aren't interacting with the same handful of races during their campaign. As has been mentioned Warhammer II will feature a different campaign setting to its predecessor, focusing around the New World which consists of the Western hemisphere continents of Lustria and Naggaroth, as well as the Elven island of Ulthuan and the jungles of the Southlands. In the Warhammer Fantasy world these lands are located differently to the areas seen in the Old World setting of the original Total War: Warhammer. In terms of physical size the in-game map is similar to the first game, but it will roughly a third more conquerable regions spread out across a number of continents and dangerous seas. For owners of both WARHAMMER I and WARHAMMER II, our first content release shortly after launch (free of course) will be a vast, combined campaign map representing the geographical areas of both games in a single map. This will allow you to start epic campaigns as any owned race (including any DLC races you own). This will be shortly after launch, weeks not months, and will be our very first content release. Please note again that this feature will not be available at launch, but will be released later. Still, it sounds awesome! As CA have said, this larger 'mega campaign' will feature the lands explored in both Total War: Warhammer games and allow you to run a campaign as any one of the playable factions from both games, fighting on an even larger world against a greater number of opponents, all with unique campaign objectives. Bear in mind that, because of the size of this 'mega campaign', it might be the case that a number of small factions are cut out when the two maps are combined in order to help maintain performance. Furthermore the campaign will be more sandbox in nature, with the Warhammer II Vortex campaign being the one to focus on the narrative aspects of Warhammer. Alongside its new factions, campaign setting, and the 'mega campaign' Warhammer II will also have a range of new features unique to CA's latest title. This includes the central objective of gaining control of the Vortex, which sees the player racing against the AI - and, for the first time in Total War, if you take too long they will beat you to this end-game objective and win, even if you haven't bee destroyed. Moreover, each faction will have a number of specific rituals to cast which will increase their ability to affect the Vortex as the game goes on, helping to build this climatic end-game scenario. There is a host of other new gameplay features that will be detailed over the coming months (including plans for Mac and Linux version of the game!) so keep your eye on this spot for future news. Some, however, have already been announced: naval combat will be conducted via auto-resolve, but there will be some new naval-related campaign features and multiplayer battles and campaigns will be present, and as each race has two unique legendary Lords (and thus starting positions) players will be able to enjoy a two-player co-op campaign as the same race. As with WARHAMMER 1, Modding using the Assembly Kit, and Steam Workshop support, will be both be available very shortly after launch. With this mind it all seems pretty standard stuff, the game uses the Warscape engine so (moving on to pure speculation) modability will likely follow a similar vein as recent Total War titles, with community tools and resources, such as the Pack File Manager, likely to work after some optimisation. That brings us to the end. Please feel free to drop a post in the section below if you have any questions or comments, and for more Warhammer discussion visit the forums here on TWC. A very special thank to Shankbot de Bodemloze, who have joined us as a guest writer for this Preview. If you liked what he wrote, plese don't forget to show him appreciation by using the small green button! Another standalone DLC for 80€ + preorder + 17 and more patch incoming. Any review for another historical total war game ?